At this point in my life (I'm safely into geezerhood), I have never heard tubes except in a high end audio store. I've decided that since I have had Klipsch since the 70's I ought to at least listen to them with tubes. I've thought about the new McIntosh integrated amp which did sound nice in the showroom, but I'm not yet convinced how if I want to. I came across a Jolida JD102B and am scheduled to audition it Tuesday afternoon. I know this isn't top of the line, but I sense I can own it for a few hundred bucks, so I'm considering it-assuming I like the sound I hear. It's 15 years old, has had one set of tubes replaced but is promised to be in very good cosmetic shape and still sounds "great" according to the person selling it. What would a fair estimate of value be for something like this? I assume I might need to replace tubes soon, etc. Any thoughts would be appreciated. I'm not in a hurry to do this, but have been looking. Would I be better off to experience one of the other lower end offerings as opposed to something 15 years old? Kinda old but you said few hundred bucks. I do not think I would pay much more than $200 and would have to think real hard if the price is $300 considering it may need the power supply caps replaced. If you can replace them yourself it would make it more desirable for say $300 but if you cannot I would probably let it pass at $300. 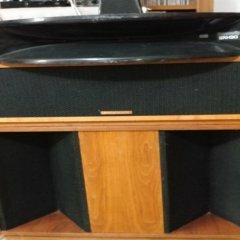 For $200 definitely go for it if you like the sound. Hi @dbomberger ... yes; "had to try tubes" also. Got a $1000 Bob Latino VTA--70 amp, and yes ... it does sound nice. Tried in in my "stereo room" (with Forte's) and even spend another $500 upgrading my pre-amp. OK; nice ... but not any better than my old Marantz 1060 I had it hooked up before. Know I'll catch "hell" from the tube guys for this comment Hey; for $200-300 try it. 15 years old is mere childhood for a well built tube amp. 40 to 60 years old with a good restoration is more like it. Think Fisher, Scott, Dynaco and keep an eye on the Garage Section. If you buy right you should have no problems selling it for what you paid if you don't like it. Kind of my fear, but I guess I'm in the mood to experiment. Haha ... why not? Have fun! Which Klipsch will you be driving? What you are considering is a push pull tube amplifier and yes many quality SS amplifiers can and do sound much like a push pull tube amplifier. Where you get a much different sound is with a single ended triode tube amplifier. The difference is the curves of the active device, tube or transistor. Most all transistors have curves that are very similar to a pentode tube and a pentode tube is most always used in a push pull tube amplifier. Hench the similar sound in push pull technology. Pentode tube curves go horizontal very quickly whereas triode tube curves go vertical and can actually curve vertical going the opposite direction. Generally you can get a better deal in a push pull tube amplifier then what a quality SS amplifier cost with the comparable sound which makes them a good deal for outstanding sound. To really experience tube sound you need to hear a single ended triode tube amplifier, SET tube amplifier. I waited till I was in my 60's to try tubes and I am very much glad I finally did. Forte III's when they arrive. Potentially Cornwalls. I sold them three weeks ago to please the wife but am thinking that may have bee a big mistake-but rectifiable. I'm looking at some of the equipment you have listed such as the sx-1250 and Yamaha... with tubes you will likely not have quite the strength of low end that you have with those SS units. For example, I love my VRD's and top to bottom they beat everything I've heard SS or tubes without spending many more thousands of dollars. They don't "slam" on the low end though like the Pioneer but where most of the music is the sound is glorious with the VRD's! The Yamaha in class A mode might come a bit close (I'm thinking of the CA-2010... I don't have the CA-800). If the Yamaha in class A sounds better than your tube amp then you got the wrong tube amp imho. I'm thinking of moving my SX-1250 to my modified La Scalas temporarily but I've been slow due to the 2 flights of stairs and multiple doors I'll be facing. It would be fun to compare in my main setup though! Buying used for later resale is a good idea to start but don't waste your time with cheap toy tubes. You won't really learn anything that way. I think tube amps are fun, I have had several, though none at the moment. A thing worth having If you are in geezerhood, is one with a remote. 👍 You do not want to keep getting up and down from your listening seat to play with the volume. imho, That is too old school. Thanks, great to hear from someone with some similar equipment. The 1250 is really great-as is the CA-800 in class A. Different experiences, but both very good. I'm actually going to have two different systems going. One will be in a smaller room and mostly for Vinyl which is where I am envisioning the tubes living. Thanks for the info. I am currently using Belles with Community SRH90 mid-horns in place of the stock mid-horn. Using the stock driver via an adapter and the stock AA crossover. Any of the amps listed should also work with the Cornwall or Forte. And a bunch of other PP tube integrated and power amps. I have tried a variety of solid state amps but they are not my preference - definitely prefer the sound of the SE tube amps best followed by the PP tube amps. My listening room is somewhere around 20' x 30' and even the 4 watt/channel Almarro is plenty for Classical, Jazz, Blues, Progressive Rock and Classic Rock. Buy used. It's unlikely you'll get the one you really want right off the bat. Buying used allows to experiment with different amps with little to no loss upon resale if you buy wisely and decided to try something else. Get the Jolida. I've owned three different Jolidas (but not the 102) and they've all enjoyed a euphonious synergy with my Forte II's. One word of caution: 20 watts won't seem like enough unless your room is very small or your speakers are very efficient or you listen to strictly 16th century lute music. What do you plan on driving with that JD102B? Also: 15 years is not necessarily "old" for electronics (especially amps). I have unrestored amps, receivers, CD players, and tape decks from the late-80s through 1990s that all work flawlessly (knock on wood). Circa 25-30 years of age is where I start worrying about parts dying and caps drying and that kind of stuff...speakers age noticeably faster imho due to mechanical fatigue, foam dry rot, wear of the furniture finish, and deterioration of glues/adhesives, etc.